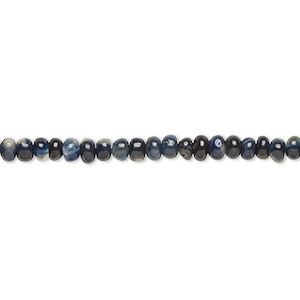 Bead, sapphire (heated), 4x2mm-5x3mm hand-cut rondelle, B- grade, Mohs hardness 9. Sold individually. Item Number: H20-2167NB Have a question about this item? The finest-quality gemstone lends itself to truly elegant jewelry. 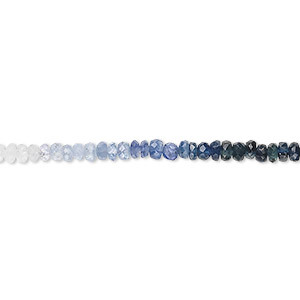 This sapphire rondelle displays a striking clarity with colors that range from medium to dark blue. Sizes, shapes and colors may vary with handcrafted items. 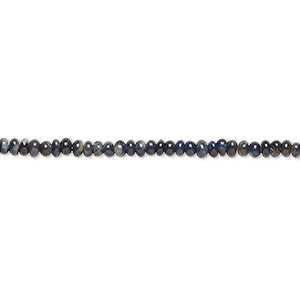 Bead, sapphire (heated), 2x1mm-4x2mm graduated hand-cut rondelle, B- grade, Mohs hardness 9. Sold per 15-1/2" to 16" strand. Bead, sapphire (heated), 3x2mm-4x3mm hand-cut rondelle, B- grade, Mohs hardness 9. Sold individually. 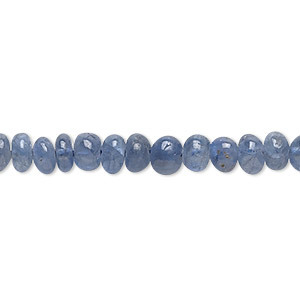 Bead, sapphire (heated), 3x1mm-4x2mm hand-cut rondelle with 0.4-0.6mm hole, B- grade, Mohs hardness 9. Sold individually. 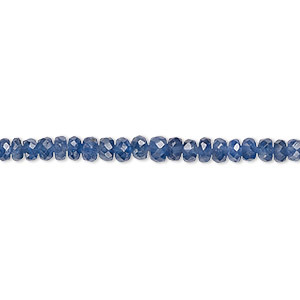 Bead, sapphire (heated), shaded, 2x1mm-4x3mm graduated hand-cut faceted rondelle, B grade, Mohs hardness 9. Sold per 15-1/2" to 16" strand. 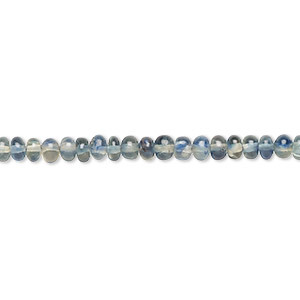 Bead, sapphire (heated), 3x2mm-4x3mm hand-cut rondelle with 0.4-1.4mm hole, B- grade, Mohs hardness 9. Sold per 13-inch strand. 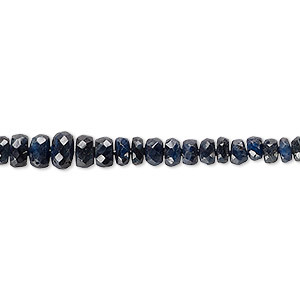 Bead, sapphire (heated), 2x1mm-4x3mm graduated faceted rondelle, B grade, Mohs hardness 9. Sold per 8-inch strand. Bead, blue sapphire (heated), 2x1mm-3x2mm hand-cut faceted rondelle with 0.3-0.5mm hole, B- grade, Mohs hardness 9. Sold per 8-inch strand, approximately 140 beads. Bead, blue-green sapphire (heated), light to dark, 3x2mm-4x3mm hand-cut rondelle with 0.4-1.4mm hole, C grade, Mohs hardness 9. Sold per 13-inch strand. 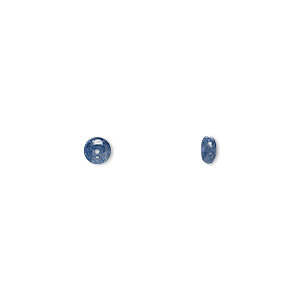 Bead, sapphire (heated), 2x1mm-3x2mm hand-cut rondelle with 0.4-0.6mm hole, B- grade, Mohs hardness 9. Sold per 13-inch strand. 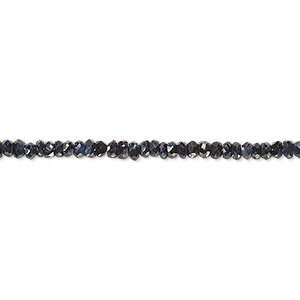 Bead, sapphire (heated), dark, 2x1mm-5x3mm hand-cut faceted rondelle with 0.4-1.4mm hole, C+ grade, Mohs hardness 9. Sold per 15" to 16" strand.